Excellent design is matched with quality construction. For those who are looking for split-seconds complications, the Sinn is a possible entry point and represents excellent value. Perhaps the price if one does not bother about complications. It may be potentially confusing for some given the myriad of watches to choose from at this price range. Sinn is entering into Omega and Rolex territory at this price. 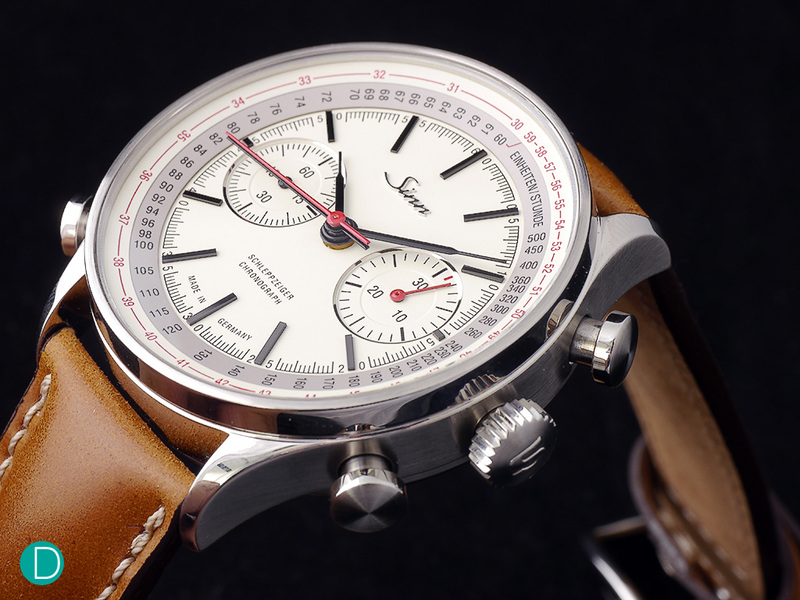 The Sinn 910 Anniversary Split-Seconds Chronograph Watch is a one of its kind split seconds offering at this price range. An immediate higher price range for split-seconds complications will include the Harbing2 or the IWC Doppelchronograph. Either way, the Sinn offers great value for a split seconds chronograph, limited edition timepiece, great design, all in a highly wearable and versatile timepiece. Sinn releases the very special 910 Anniversary split-seconds chronograph, an understated but generously well designed piece. As already established since the brand’s earlier days, Sinn truly has an eye for quality without the woes of ‘over engineering’ things. For this piece, we particularly like Sinn’s approach in releasing this limited edition. Instead of just having a stock chronograph, the brand has taken to great lengths to build a split second complication, a highly costly and complicated process. And for that reason, deserves an applause. The Sinn 910 Anniversary Split-Seconds Chronograph is cased in stainless steel with a nice mixture of satin and polish surfaces. Congruent to its Bauhaus theme, the bezel is thin and leaves more space for the dial. The watch has heft, while not large, it is comfortably sized at 41.5 mm in diameter. The thicker movement results in a thicker case, at 15.5 mm. Very much a classic tool watch, the case features nicely tapered lugs and traditional pushers, but opts for a less conventional split seconds pusher at 8 instead of the usual 10 position. As with Sinn’s quality manufacture, the watch comes fit with sapphire crystal on both front and back, with double sided anti-reflective coating on the top glass. Sufficiently sporty with the buttons, and especially when on a bracelet, the watch is also versatile as a classic beater when on leather. Sized at 41.5 mm, the watch dial has adequate space for clarity and balance. Sinn sticks with its German roots and creates a dial which resonates with Bauhaus design inflections. The dial is an off white, almost cream colour painted dial, with contrasting scales. It is well balanced, with congruent font types and sizes. So clean and simple, the dial could easily scream military. The choice to put on syringe hour and minute hands scores a major like from us, considering that it draws on vintage timepiece designs, especially in the period of the 70s. Not that we like everything retro, but this hand choice works particularly well on this piece. The caseback features the decorated Valjoux movement, as well as the limited edition numbers. The modified and decorated 7750 movement features blue painted screws and parts, golden chatons and superlative finishing. Some may cry foul that this is after all only a 7750 movement, found on almost every other automatic chronographs in this price category. But, there is a huge difference. 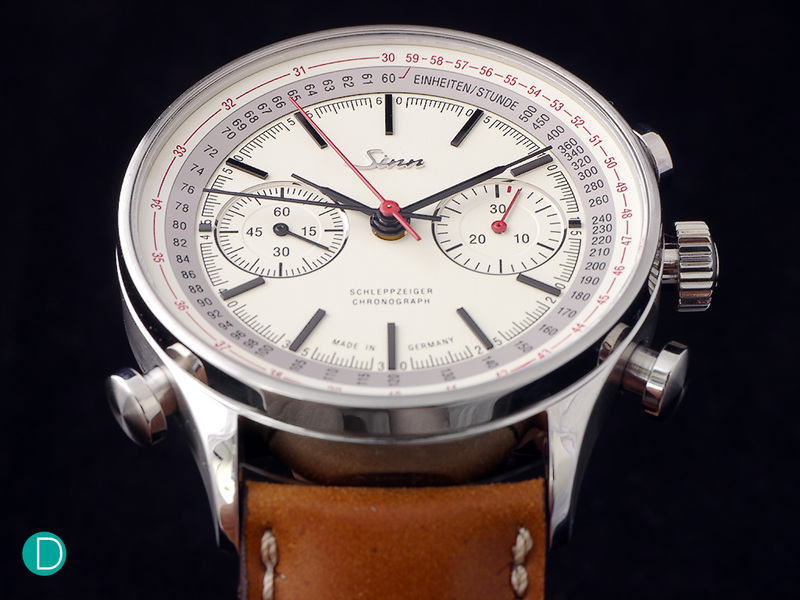 This is a split-seconds chronograph movement. 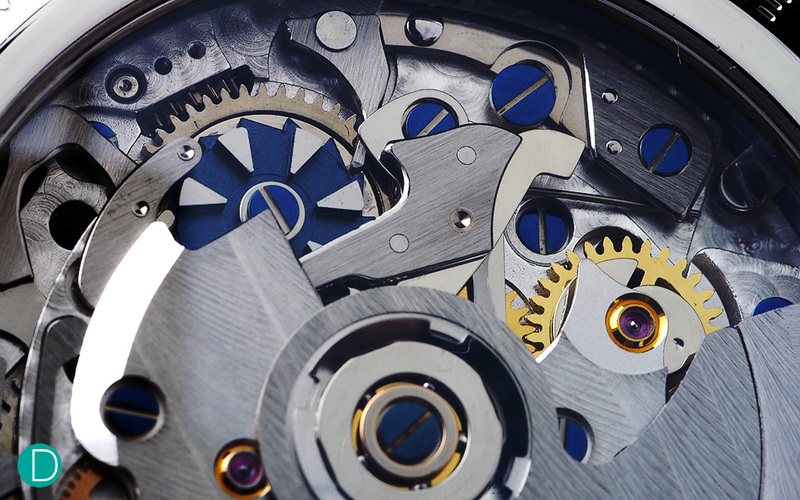 Split second complications are a rarity today, because of its complex mechanism and high costs of production. 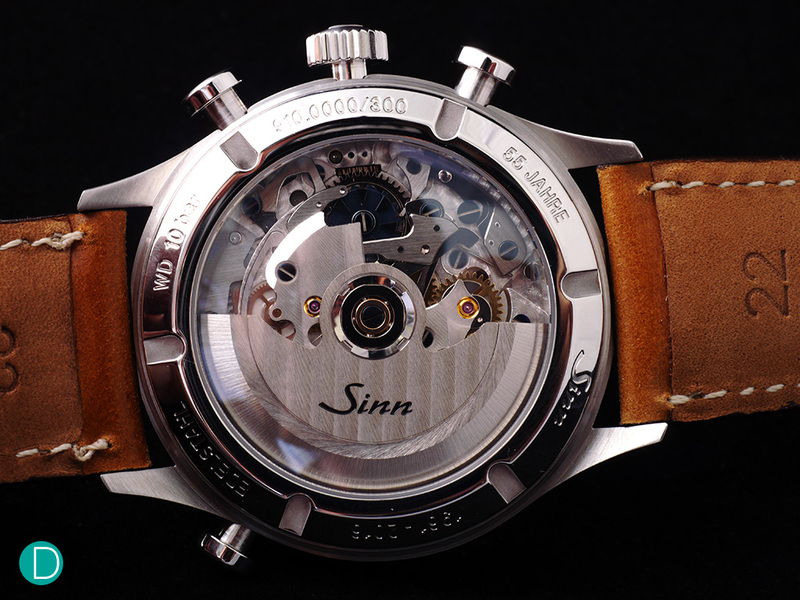 Sinn could have opted for a simple chronograph, but instead they modified a Valjoux 7750 and incorporated a ratchet and column wheel lever activated split seconds function. Furthermore, the movement finishing and decoration on the movement is not the usual off-the-mill stock finishing. This seems like a more premium movement, be it in function or aesthetics. Finishing wise, the watch comes with dressage on the bridges, golden chatons, perlage on the lower plates and what seems like painted blue screws and wheel. Then of course, the downside to higher costs for the brand is the price the customers have to pay. A last wrist shot with the Sinn 910 Anniversary. Limited to 300 pieces, the Sinn 910 Anniversary Split-Seconds Chronograph Watch is a one of its kind split seconds offering at this price range of approximately S$9,800 with GST. 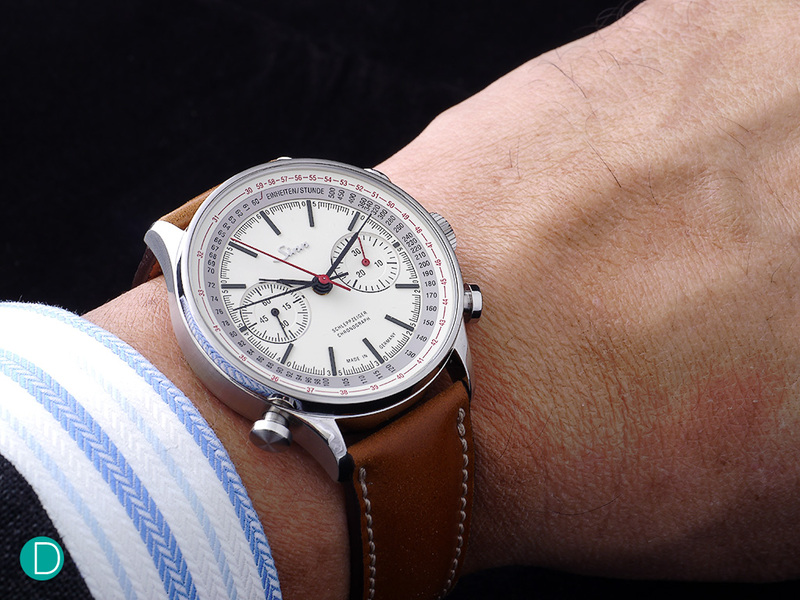 An immediate higher price range for split-seconds complications will include the Harbing2 or the IWC Doppelchronograph. Either way, the Sinn offers great value for a split seconds chronograph, limited edition timepiece, great design, all in a highly wearable and versatile timepiece.